Pixel Qi has come out with two new low power screens to complement their existing panel. The new ones go up in rez or down in size, take your pick. If you don’t know who Pixel Qi is, read this. 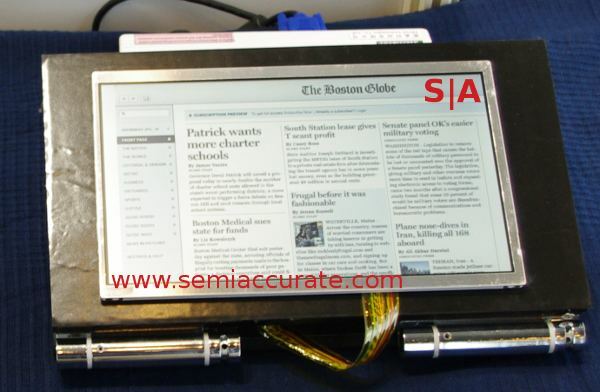 If you are too lazy to do that, the short story is that they are a spinoff of the OLPC project that makes really low power transflective LCD screens. With the backlight on, they look like normal LCD screens, but are a bit lower power due to some tricks. If you turn the backlight off, reflected light takes place of the backlight. Backlight on, you would be hard pressed to see the difference between a Pixel Qi screen and a similar specced ‘normal’ LCD. Backlight off, the colors are extremely washed out or black and white, but the rez is three times what it was with the backlight on. And it is readable in extremely bright sunlight. You can even play some cool tricks like turning a screen in to an amazingly fine monochrome panel, perfect for e-readers and the like. When you are in this mode, power drops to about 20% of what it was, but as you can see from the link above, 7 point fonts are eminently readable. It is very cool. For once, purposeful bad photography! If you are sceptical, the picture above is one of the new screens Pixel Qi introduced at Computex. Unlike normal SemiAccurate procedure, this one was purposely taken so the flash would blow out the screen. On a normal LCD, the screen would be white and nothing would be readable. On a Pixel Qi screen, it just increases the contrast making things look better. To a point. Back to the show, at Computex, Pixel Qi added two new screens to their current 10.1″ 1024 * 768 panel. You can now get the technology at 1280 * 800 in the same size panel, or a 7″ version with the old 1024 * 768 rez. Since the highest power draw on a device is the screen, the sooner this technology gets everywhere, the better. CPU upgrades are good, and dropping their power is never bad, but you are attacking a small percentage of the overall problem. Pixel Qi screens have the potential to do much more than a CPU shrink at a lower cost premium.